It has been said that there are no second acts in American lives, but the leaders of the Roger Williams Park Zoo hope that the opening of their Faces of the Rainforest exhibit will be just that. Dr. Jeremy Goodman is hoping to exorcise ghosts from long before he became the zoo’s executive director. In 2006, voters approved $11 million in borrowing to help pay for $35 million in renovations to the zoo. The centerpiece of the project: a revamped exhibit for the zoo’s beloved polar bears. As work got underway, the polar bears headed to another zoo. But the project sputtered under financial difficulties and was finally canceled in March 2012, and the polar bears never returned. Now, using $15 million in borrowing approved by voters in 2014, the zoo has built a $14-million rainforest exhibit. It opens Friday at noon as the centerpiece of the 40-acre, 146-year-old zoo. Goodman said keeping faith with the promise to build a first-class rainforest is worth the extra outlay and extra construction time for the project, which was once estimated at $9 million and had been expected to open last spring. The result is an exhibit centered on a 40-foot-high, light-filled glass atrium in which monkeys and tropical birds will be free to mix with zoo patrons. The pool in which Amazonian giant river otters play is fed by a waterfall. And signs throughout draw the link between the rainforest and humans, the faces of the rainforest, around the world. Planning for the project began more than three years ago, with construction commencing more than two years ago. Zoo officials began assembling the 44 species that will call this rainforest home more than a year ago. Nine of the species were already at the zoo, while 35 others were collected from 40 other zoos and aquariums, according to Goodman. The animals began moving into the new exhibit about a month ago. 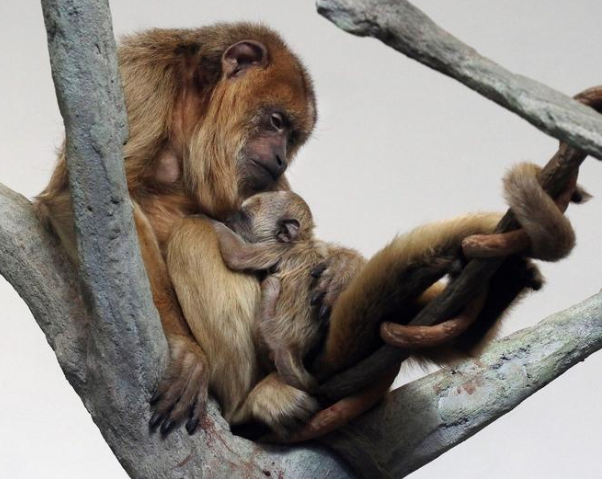 Already, two babies have been born, a black howler monkey and a red-rumped agouti, both of which were on display on Thursday. The visit continues after exiting the atrium, with sculpture and interactive games and activities. “When the weather’s nice, the whole outside experience is part of it,” Goodman said. He is hoping for some of that nice weather Saturday — forecast sunny and in the low 40s — and the zoo’s first-Saturday-of-the-month of free admission for Providence residents to combine for a big crowd at the rainforest’s opening weekend. The Faces of the Rainforest exhibit is centered on a 40-foot-high, light-filled glass atrium in which monkeys and tropical birds will be free to mix with zoo patrons. Amazonian giant river otters play in a pool fed by a waterfall.